Not a few people may have thought to record their own singing mixed with music for playback. What’s annoying is either the process is either complicated or the final record effect far from good. I happened to find a smart tool that can perfectly solve such issues. Here is a real step-by-step guide, and hope it can be a little helpful for you. First, make sure you have a microphone and it has inserted to your PC. To reduce cacophony disturbance, the program offers a VAS (Voice Activation System) mode- set the silence sensitivity to filter the noise that is lower than your voice and may cause noise of your singing. Choose the recording mode as VAS mode rather than the default Normal mode. And click Settings to customize. Drag the slider to a certain point you want. 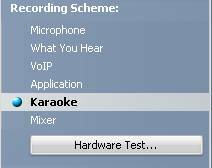 Set Karaoke mode-choose the “Karaoke” from the six options below. In this mode, the recorder allows you choose the background music, then records and mixes voices both from microphone and the background music. And if you check the “auto-stop recording when background music over”,” box, the recorder will record once the song is over. After above settings finished, we can start to “record” now. Here we go. After finishing recording, play the recorded file directly to validate the effect. 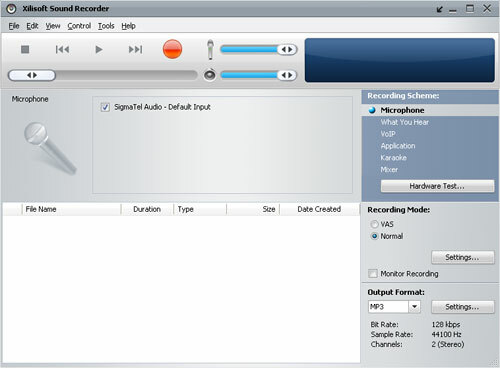 Xilisoft Sound Recorder supports MP3, WAV, and WMA which you can choose before recoding. What is also very practical in the offered recoding modes is VOIP which can recode the voice from instant communication tools. I have used the recorder to record my own album—in fact only 5 songs included. The sound quality, I have to say, is stunning, wow. How to convert AIFF to MP3? How to convert AAC to MP3?